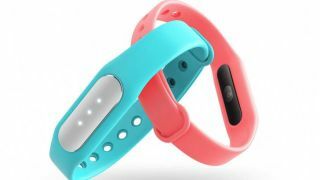 Chinese tech giant Xiaomi has announced the release of the Mi Band 1S - an affordable follow-up to its smash-hit Mi Band. The original device caught the world's attention by essentially being so cheap. While a Fitbit Flex is somewhere in the region of $120, a Mi Band could typically be found for as little as $20. It works just like its more well known competitors - logging activity and pairing with a phone via Bluetooth to give users fitness information. The company appears to be doing the same again - the new band will retail for as little as $16. This time around though, the tracker will also pack a heart-rate sensor, keeping pace with the likes of the Apple Watch and Fitbit Charge HR. The new device weighs half a gram more than the original - and is a slightly different shape to the first Mi Band (it measures 37 x 13.6 x 9.9mm). That means it won't fit in bracelets that you may have bought for the original. In slightly better news though, the new device retains the Mi Band's IP67 rating, meaning that it has water and dust protection. The Mi Band 1S is on sale now in China for CNY99 - about $16/£10 - and we expect it will be available in the West shortly.